Although the territorial fragmentation of Germany had obvious political disadvantages – notably vulnerability to foreign pressure or even invasion – it also acted as a boon to architectural production. Simply put, fragmentation meant that various secular and ecclesiastical princely courts competed with each other to create the most magnificent architectural creations. 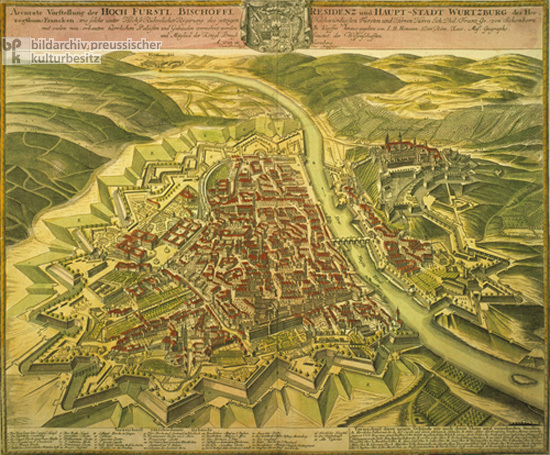 This engraving offers a bird’s-eye view of Würzburg in 1723. The title emphasizes the glorious additions that Philipp Franz von Schönborn (r. 1719-24) made to the city’s architectural landscape. It reads: “Accurate depiction of the high princely episcopal residence and capital city of Würzburg of the Duchy of Franconia, as it was expanded with many newly built magnificent palaces and buildings under the glorious present rule of the reverend prince and ruler Joh. Phil. Franz Gr. von Schönborn. ” [“Accurate Vorstellung der Hoch Fürstl. Bischöffl. Residenz und Haupt-Stadt Würtzburg des Herzogthums Francken, wie solche unter Höchst Rühmlicher Regirung des jetzigen Hochwürdigsten Fürsten und Herren Herrn Joh. Phil. Franz Gr. von Schonborn mit vielen neu-erbauten herrlichen Palästen und Gebäuden vermehret worden.”] Würzburg was the seat of prince bishops until 1801. As the engraving shows, it was divided by the Main River and surrounded by elaborate fortifications. The building in the upper-right is the Marienberg fortress, where the prince-bishops resided until the early 18th century. Copperplate engraving by Johann Baptist Homann (1664-1724), 1723-24.